My team and me are teaching and guiding scuba diving for more than 15 years. I am originally from the Netherlands, but moved to Bali in 2008. After diving all over the world, we decided to open my own dive center in Bali in 2009 to take advantage of the temptingly warm tropical waters, friendly people and of course, some of the best dive sites in the world. Small classes and dive groups ensure that your safety and customer satisfaction is our top priority. 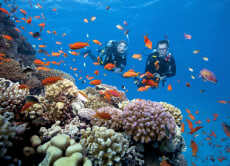 It would be a great pleasure for me and my team to assist you discovering the beauty of the underwater world!